Let's get the Southern Humboldt mountain biking community together! There has been lots of talk about getting together to do some rides in the area and we are psyched about the idea. We will be hosting 2 weekly rides leading up to the event so that everyone can get in shape and get ready to race! These rides will be open to all ages and abilities (bring along the kids, the grandparents, who ever!) and will be mellow and fun. Work on your skills, speed, or endurance. Get out, enjoy the sunshine, breathe in some fresh air :) Rides start this Friday! Rides should last about 2 hours and depending on who shows up and how people are feeling, we may just ride in the Community Park or venture over to Benbow along the Kimtu trail. 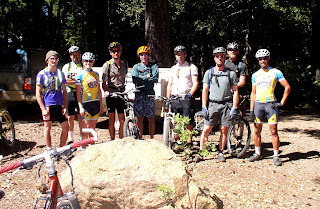 We may also host rides along the Ave of the Giants or out in the Chemise Mtn area, check the blog for any possible changes. Please bring plenty of food and water, a (mostly) working bike, shoes & gloves, and a good attitude :) HELMETS MANDATORY for all riders! Now you have no reason not to participate in the upcoming races! Get out and get in shape with your friends. The Community Park is a great gift, let's use it positively. See you there! what time are these rides? Rides are Mon at 4pm and Friday at 9am, meeting at the park. Come one, come all! Got a "real job" so I can't make it during those times. Darn. Maybe consider a little later start time in the afternoon, like 6pm for those of us 9 to 5er's? Thanks.